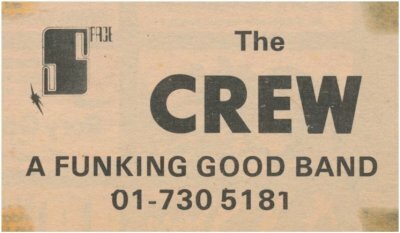 John Wright formed Crew in 1965 in London, England. As lead vocalist, lyricist and percussionist extraordinaire, excelling on congas, he and the 5-piece band earned a name for their enthusiasm. 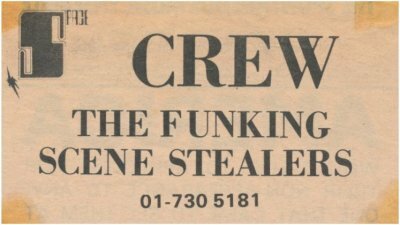 In 1971, the ever-dynamic John reformed the band ~ the new 6-piece Crew represented something different ~ with a front-line percussion team including Jon Newey as lyricist on bongos, claves, congas, maracas and... tight, funky instrumentation by: John Chichester, back-up vocalist on guitar ~ Ian Rutter on bass ~ Tony Perry, back-up vocalist on Hammond B3 organ and ~ Martin H. Samuel, songwriter on drums and percussion. Fronted by John, the human dynamo, the act was a visual spectacle that played a mix of material ~ from funky originals to covers such as unique versions of songs by James Brown, Peter Green, Sly And The Family Stone ... to name-drop but a few. Complemented by the ever-efficient road managers: Harold and Brian [except when the latter reversed a van over his own acoustic guitar] then, Glyn and Mike Lowe, who drove the excellent Marshall and Orange sound equipment in two Ford Transit vans, the band was known to be reliable and punctual. The band signed a management and representation agreement with The Space Agency, 21 King's Road, Chelsea, London S.W. 3 ~ who kept them working far and wide ... to recoup the weekly £12.00 each advance in wages! 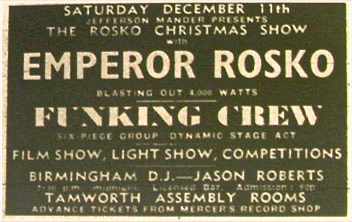 They played many notable London venues such as: Angelique Club, Bumpers, The Greyhound, The Marquee Club, Pandora's, The Pheasantry, Roundhouse [with Hot Chocolate and Desmond Dekker]. 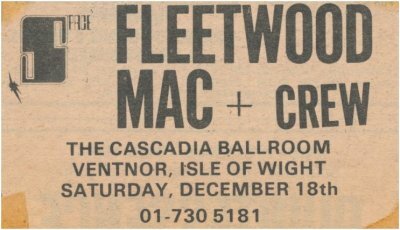 Booked at The Cascadia Ballroom in Ventnor on the Isle of Wight with Fleetwood Mac [who were a no-show] and, after spending the night in the vans, the following morning, Crew and roadies played a knock-around game of football with the boys in the Brinsley Schwarz band ~ then shared the ferry ride from Ryde to Portsmouth. 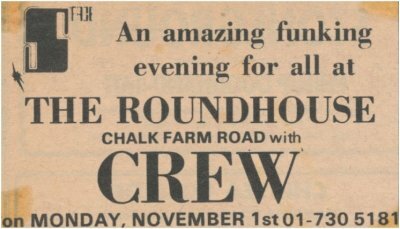 Signed to the same agency, Crew often performed alongside go-go girls, a light show and a 1500-watt sound system, with roadie Nicky Horne ~ as part of the Emperor Rosko International Roadshow. Booked by Bahlsen of Hannover, the band was photographed for a German party-snack advertisement but, for reasons best known to the director [he didn't like their look or their looks], he bought 'trash-flash' stage gear and moved members around to 'play' different instruments. An audition tape was made in the BBC Maida Vale, London studios and long since lost... as were tapes of the songs, 'Lady Of The Night' and 'Today', by Martin and Jon respectively. The demo was recorded as a prospective single at Orange Studios [in the basement known for its 'great vibe'] at No. 3 New Compton Street, London. Other song titles were: 'Open Another Door' [Martin] and 'The Raven', 'Straight No Chaser' [Jon]. 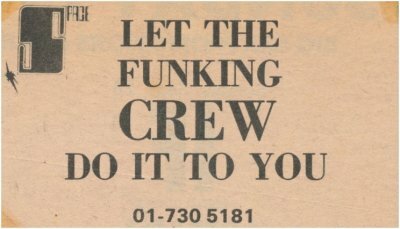 This, the funkiest form of Crew, kept at it until the spring of 1972 when Martin, known for his exacting standards (and in frustration at Tony's inability to exit his solo and play in time), was relieved of the 'anchor' position... for kicking his drums off the stage and into the audience at the end of a gig at Chelsea Village, Bournemouth. Jon left in June 1972 and formed England's Glory the summer of that same year. 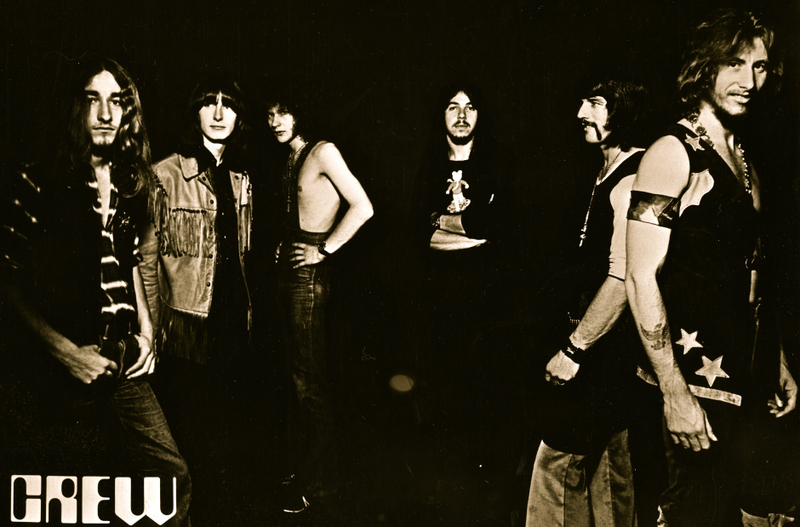 Then, when Crew split from The Space Agency, Tony invited the band home to Devon to rehearse a new set based more on Faces-style material and replacing Ian with a friend of his on bass. 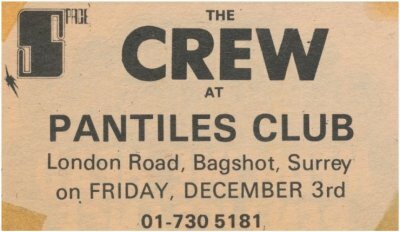 However, when seen at the Red Lion in Colliers Wood, London in the autumn of 1972, the 'new' Crew were still playing most of the numbers written by Jon and Martin. Shortly thereafter, the band broke up. Ian Rutter, who had a love of fast cars, was last heard of in 1975, working for a car sun roof fitting company. When last seen in 1983, John Chichester, who had eclectic taste in music, worked as a 'reserved but lovable' roadie for ELP and then personal assistant to Greg Lake before going to live in New York and working at Christie's, the auctioneers. Brian George Hanson, the drummer shortly after Crew recorded 'Cecilia', recalls... 'With Ricky Norton on guitar [or was it his brother, Rob] and Alan [?] on bass, Crew was a very hard-working band.' Martin previously played in Pure Gold with Rob Norton. Brian moved on to Catapilla who were also signed to The Space Agency.